Disclosure: This post was sponsored. All opinion are 100% my own. Let’s face it…it is nearly impossible to get a good job these days without an education. Sure, there are plenty of minimum wage jobs that do not require you to pursue a skill-oriented education, but who can survive off minimum wages anymore. When I was first starting out as a military spouse, there were very few options afforded to us for education like the programs offered to our husbands. If a spouse wanted to have a career that required higher schooling, families had to pay for tuition, books, etc. themselves. Back when I was in college, it cost about 12,000/year for tuition and books. If I were to go to that same college today, it would cost probably double or triple that amount. Another thing to think about is that being in the military you move around a lot! Spouses usually move with the service member and this can impact the transferability of credits. I know this firsthand because when I went to transfer my credits about half of them didn’t transfer. That is a lot of wasted time and money! Thankfully there are programs now like MyCAA, The Military Spouse Career Advancement Account, that offer money to spouses to pursue higher education goals. These programs are great, but now that the funding is there, only half of the battle is won. You still need to pick a education provider that won’t charge you and arm and a leg for what seems to be a never-ending journey toward a degree or professional certificate. That’s where schools like Martinsburg College come in. They offer distance learning classes in a variety of fields that are very affordable. Not only that, Martinsburg College also provides books online and a state of the art learning management system to help enhance your learning experience without adding cost. Just the books alone save you between $100-$300 per course. If your dream is to go back to school but you cannot afford the tuition, the MyCAA program provides eligible military spouses with the needed financial assistance to pursue the education and/or career training in a portable career field with no out-of-pocket costs. Martinsburg College is an accredited provider of educational programs for spouses of active duty military members who are looking to make use of their MyCAA credit. A certificate program is fully covered by MyCAA and can help improve your chances at employment. It’s also online which means if your spouse is deployed, you are able to complete the course from anywhere. How awesome is that? When students do not complete their program because of unforeseen or uncontrollable reasons, they are protected by an exceptionally generous refund policy. Students will receive a refund based on the amount of coursework completed (pro rata) through 50% of their program. This means if a student does only one course then they are charged for only one course. Not only are the textbooks made available within the learning management system, students can choose to utilize a tablet which the college provides on loan for more comfortable and portable access. The college also provides a resource library of thousands of textbooks which are available online at no cost. Many colleges only offer a few hours of availability during the week. Students at Martinsburg College may access instructional support Monday through Thursday 7:30 AM – 11 PM, Fridays 9 AM – 6 PM, and Saturdays 11 AM – 6 PM. If you require one-on-one instruction or direct telephone or digital tutoring sessions the college provides those resources. The instructional methodology of the college accommodates a wide variety of learning styles as well as providing for flexibility of time and place for engaging in coursework. Don’t Let These Valuable Benefits Expire! 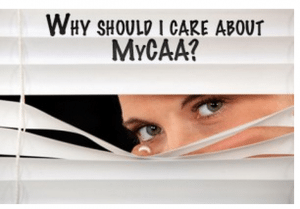 If you have been thinking about getting a higher education, I highly reccommend checking out what MyCAA is all about. I was reading how 75% of MyCAA benefits are currently going unused as only 25% of eligible military spouses are taking advantage. Please don’t let these valuable benefits expire! These courses can drastically improve your hireability and are absolutely no cost to you. Military Spouses In The Field: Career Development is a great group that I joined where military spouses can network, learn about great educational opportunities and much more. I encourge you to join the group and introduce yourself!